This book consists of three novellas or long short stories: ‘Blood Follows’, ‘The Lees of Laughter’s End’ and ‘The Healthy Dead’, each about a hundred pages long. The three tales concern two necromancers, Bauchelain and Korbal Broach, and their luckless manservant, Emancipor Reese, and their disastrous adventures together. The first is a murder mystery, with a city guard captain as a main protagonist, and it shows how Reese comes to be employed by the two dark sorcerers; the second is about undead beings rising on a voyage by ship; and the third is about the fall of a fanatical regime that punishes all forms of indolence and unhealthy behaviour. 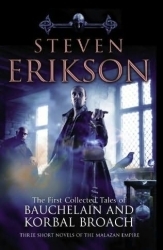 The three stories take place in the world of Steven Erikson’s Malazan Book of the Fallen series; not only that, but they are evidently contemporaneous with the events of the epic fantasy series. Bauchelain, Broach and Reese have walk-on rôles in at least one of the books – I don’t remember which. These three tales have a more comedic feel than the Malazan books – they are full of murder and mayhem treated as slapstick. Luckless Mancy, the manservant, reads almost like a Robert Rankin character, full of self-pity and knowing verbosity at odds with his working class station. The stories are similar to the Malazan books in the way they are structured. Instead of sticking with a single protagonist’s viewpoint, they skitter about between a number of viewpoints. But, whereas the novels dedicate long chapters to each character, or a pair of character, each chapter in the Collected Tales takes up no more than four or five pages, and often as little as a single page. This, I feel, gives the novellas a very disjointed feel, making them difficult to follow and difficult to care about. The best story is the last one, ‘The Healthy Dead’. Its narrative is the easiest to follow – perhaps because I’d had time to acclimatise to the writing style – and its satire of the health and fitness fads of our world and the zeal with which people follow them is quite entertaining. On the whole, though, this volume left me underwhelmed. Erikson’s writing style seems more suited to the epic narrative of the high fantasy series and less to the intimacy of the short story. As a completist, I like to read these ancillary volumes that authors put out, but this book really adds nothing to The Malazan Book of the Fallen and the stories themselves aren’t that great.